Hi there! 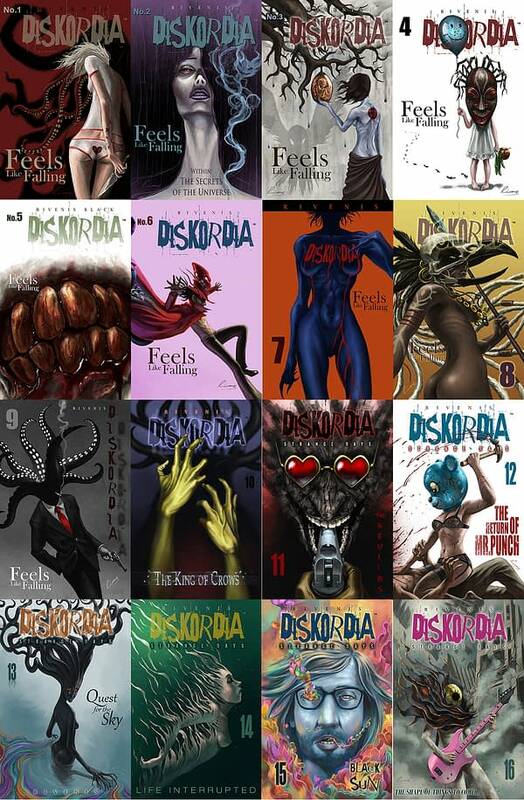 My name is Rivenis, and I’m the sole creator of a surreal fantasy graphic novel series called Diskordia. 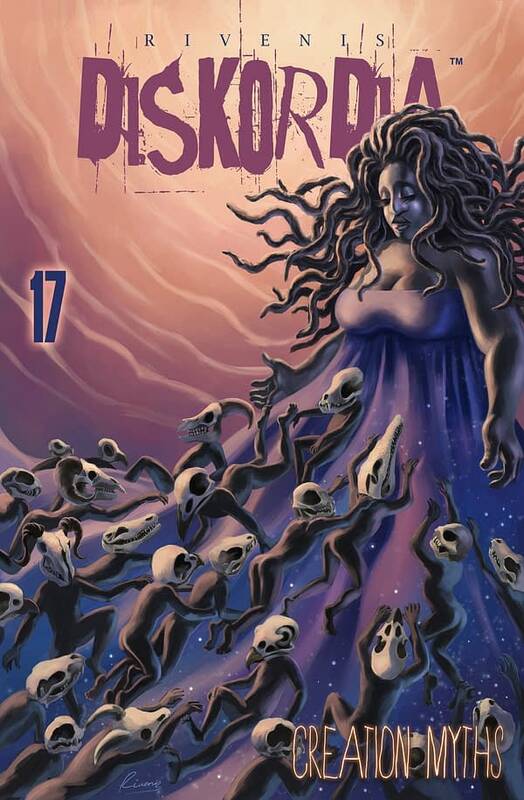 This comic first debuted in 2011 and to date has over 600 pages spread across 17 issues published, with much more to come. 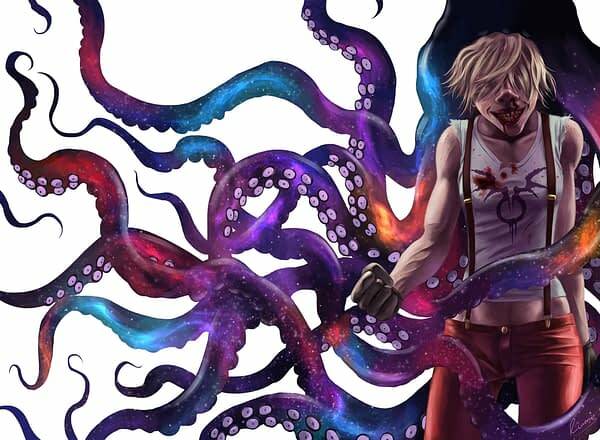 Let’s be honest: there aren’t too many completely independent comics that make it so far. People tend to be impressed and ask me things like “How do you manage to do it all by yourself?” or “Wow, you’re a machine.” Usually I act humble and say it’s just a combination of consistency and insanity. While this is indeed true, it’s not the whole story. I think it’s time to be a little more honest about the realities of creating a long-form graphic novel series full time with no industry support. I quit my life-draining day job in 2010 to pursue a dream of being a freelance illustrator, and then slowly realized that what I really wanted to do was create my own visually driven stories I have drawn in a well-below-poverty-line salary. The more committed I became to creating Diskordia, the worse it got. Earning anything resembling a livable salary is a pipe dream, even for those with successful comic works. Platforms such as Comixology and much more recently Patreon offer ways to monetize and earn money on a consistent basis. These do help, but honestly don’t add up to more than a few hundred dollars a year. Creating a comic independently as a full-time job honestly makes no sense. Yet, I did it anyway. I made the conscious decision to commit myself fully to doing the one thing that I truly love, even though I knew it was unlikely that I would be able to sustain myself while doing it. Why? And How? The simple answer is that I’m selfish and spoiled. I don’t mean this as some kind of humblebrag in the vein of the valiant obsession of the artist and his commitment to his craft. No, I mean that I put my own happiness above financial responsibility. I sit down and create while the world burns down around me. I live in the world of my mind more than the world that requires me to pay taxes and mortgage payments. This is the mindset that allowed me to consistently churn out issue after issue and weave the fanciful tales of Jackal Black and his slow discovery of the twisted and wonderfully vivid dreamtime. For me, I barely feel the sting of the sacrifices I have to make for this to happen. I’m broke, but I can wake up every morning and create. I can’t afford to start a family, but I can go online and proudly look at all the stories I’ve made available to an eager public. When things would get bad, I’d comfort myself with the thought that eventually my book would find a big enough audience. Eventually it will become self-sustaining and my sacrifices would be worth it. This might very well be true. If the ongoing Kickstarter is any indication, then I haven’t been shouting into the void all this time in vain. That’s not the point, though. The truth is, even if I somehow knew in advance that I would never become successful making Diskordia, it wouldn’t deter me. Creating this comic is life to me, and I don’t mind dying for it. I mentioned before that my selfishness is NOT a good thing, and here’s why. I wouldn’t have managed to last this long without a support system. Namely, the family I live with. I’m not gonna say that I was able to completely ignore my financial responsibilities. Not even I’m that lucky. I will say, though, that living with family acted as a nice financial buffer whenever I was late with my payments or during the periods when I was unable to pay anything at all. Most freelancers will relate to that last point. The thing is though, my family isn’t rich. Far from it. My responsibilities aren’t just a formality. There’s a very real pressure to prioritize stable income over self-actualization. It’s a pressure I acknowledge and succumb to at times. But in the end, I’m always drawn back to my comic and the dream of making a decent living creating it. A less selfish person would have given up on this idea after so many years of discouragement in order to be of more solid financial use to those who depend on them. Diskordia has slowly but surely built up a pretty awesome following. Right now, the Kickstarter to print book 2 of the series as a hardcover is live and doing quite well. Industry veterans and reviewers have acknowledged the quality of the book both in terms of writing and the art. I’m poised to launch my publishing brand Void King Publishing to distribute the books, and from there, who knows? I’m at a stage right now where anyone can clearly see the potential for success Diskordia has going forward. Yet it took the better part of a decade to get here and a not an insignificant amount of selfishness. People think of my dedication to my craft as a virtue, but I don’t quite see it that way. I wanted to write this honestly for those that look up to me. Everything has its price, and it would be a disservice for me to pretend that I didn’t have to make my own proverbial deal with the devil to make it happen. Thanks for listening to me opine. If you’re interested in my work, you can read Diskordia online and support the ongoing Kickstarter campaign.